I was 15 years old 20 years ago when Motley Crue released their self- titled album. This being their 6th studio album it was the follow-up to their highly successful album Dr. Feelgood. The music scene in 1994 in general was very interesting you had a lot of different genres of music, different bands that were successful and a lot bands from the 80’s music genre that were struggling and breaking up. I was open to the new Motley Crue album with John Corabi. I love the early albums from Motley Crue but with their self-titled album the band just needed to do an album that would allow them to grow. They had a great singer who also played guitar and gave them a chance to become a heavier band and I really love the self-titled album from Motley Crue the same way that I love the solo album that Vince Neil did called exposed to which came out in 1993. A great element to the album was that it was produced by Bob Rock who produced the Dr. feelgood record. Bob Rock is my favorite music producer I know the band took a little bit longer on the record I remember in 1993 they said the album would be titled til death do us part. They changed the title of the album to just Motley Crue and I think that was a great idea. Motley Crue is one best rock albums that came out 20 years ago it was to me a lot better than grunge music. John Corabi has a heavy voice the first time I ever heard his voice was with Motley Crue and I just love how heavy his voice is. I think it’s a great record that Motley Crue can be proud of and I hope that the band today are still proud of the record that they made the band likes to sing about girls girls girls and getting laid and all that stuff. Every music artist has to make that album that lets them grow. The same way Def Leppard did the album slang which allowed them to grow the same way Bon Jovi did the Lost Highway album I think every band needs to make that record. Some bands are allowed to grow and Motley Crue they were not allowed to grow. It is the heaviest album they have done. The album on the Motley Crue catalog ranks up there in the top 3 Motley Crue albums. Vince Neil is the Motley Crue singer nobody will ever argue that. 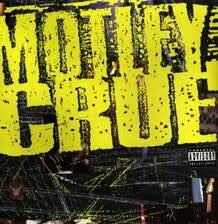 On this album we can make the best arguement that in 1994 Motley Crue was a great band with John Corabi. I still love listening to the album. I tell every rock band that I work with make an album that you still want to play and listen to 10 years from now. John Corabi still plays songs off the Motley Crue album as he should because those songs they hold up to anything that is released today. It doesn’t matter that the album didn’t sell 2 million albums like the other albums did. It matters that they made an album that still stands.